Several front pages feature pictures of Shamima Begum - after her TV interview from a refugee camp in northern Syria. 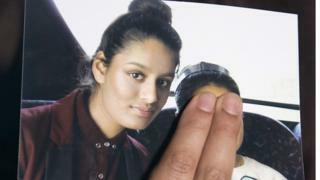 The Daily Mirror says the Briton spoke of "good times" when living under the Islamic State group, but has begged to be let back into the UK with her newborn baby. The Sun's editorial calls on the government to look at "every legal avenue" to ensure that she never sets foot in Britain again. The Times says Prime Minister Theresa May is braced for what it calls "howls of rage" - as ministers finalise the tariffs that would apply to imported goods in the event of a no-deal Brexit. The paper says International Trade Secretary Liam Fox wants to move to "zero tariffs" in as many areas as possible - but other ministers want protection for producers, including farmers, who would struggle to compete with cheaper imports. The paper points out that under World Trade Organization rules, the UK must apply any tariffs to all other countries, not just those in the EU. The Daily Mail says Britain's biggest online betting firm is giving cash rebates to those who lose large sums of money in an attempt to keep them gambling. An investigation by the paper found that players who suffered large losses at Bet365 were rewarded with weekly cash returns of up to 10%. The discovery was made by a reporter who spent three weeks working at the betting company's offices in Gibraltar. The firm tells the Mail that it takes specific and extensive actions to identify, monitor and assist customers who may be at risk from problem-gambling. The Daily Telegraph reports on parts of the country where tax avoidance has been found to be at its highest. A spokesman for the firm tells the paper that some "very normal commuter-belt towns" are becoming hot spots for admitting unpaid tax. Finally, the collapse of the airline Flybmi is a sign that cheap air travel may not be here to stay - according to the i paper. It says airlines have been forced to drive down prices in order to compete for customers - while facing higher oil prices and tax rises. The newspaper warns that companies will have to increase fares - as well as charging more for additional extras such as hand-luggage and food.